I heard her walk upstairs… and then nothing. No sounds of joy or dismay or anything. After a couple of seconds, I followed her up. At the top of the stairs, I had laid out seven stacks of books from the bookshelf in her room, each stack about a foot high. She was staring at all of the books that I had dragged out of her bedroom with a look on her face somewhere between shock and wonder. I explained that these books were all the books that I thought she had outgrown–“baby books” as I called them: board books, oversized picture books, level one readers, etc. 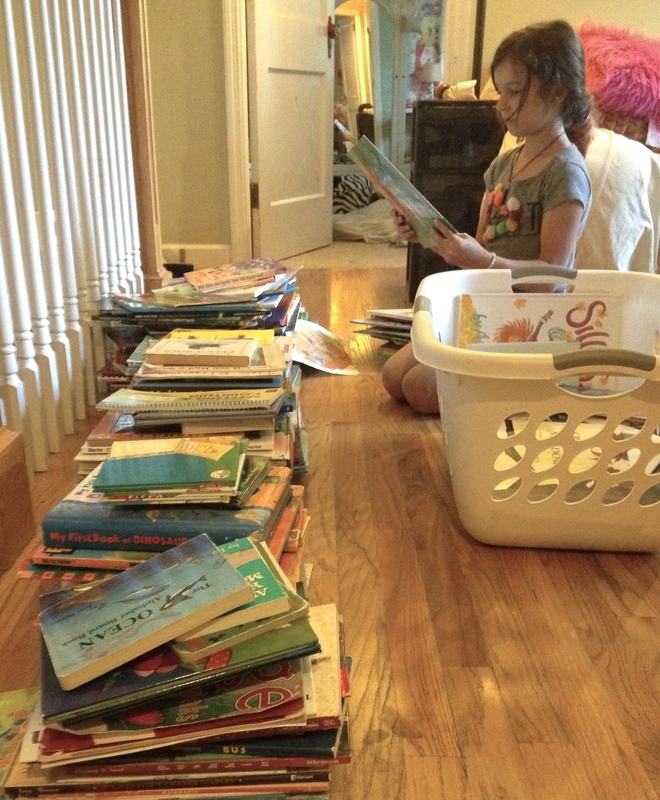 I reassured her that I had already saved quite a few “good” books, even some picture books, that were still on her shelves in her room, but these stacks were the books we were going to give away. She started pulling out one indispensable title after another, waving them at me accusingly: “I can’t get rid of this one!”; “I love this book!”; and so on. So I relented and let her sort through the stacks in her own way. She plowed through those books, pulling out probably a couple of dozen, tossing them into a clothes basket as “keepers.” Then she went back through what she had reserved and tossed back a few into the give-away pile. And she did. In fact, when all was said and done, she ended up pulling off of the shelves more books than she had saved from the give-away stack–including a few titles that I had declared indispensable. So I let them go. Well most of them, at least. You can’t blame a parent for sneaking a couple of those sentimental books back into the “keeper” stack, can you? This entry was posted in Uncategorized and tagged caring, listening, patience, simple truth. Bookmark the permalink. I have to admit: I was secretly relieved when I saw some of the books that my daughter pulled back to save. I’m always impressed by kids and how they’re able to grasp the process of sorting, deciding and moving on. When you give them the control, they often surprise you. Good job! It’s true! She did the same thing with her toys not too long ago as well. Parting with books is such sweet sorrow.